The time has come! 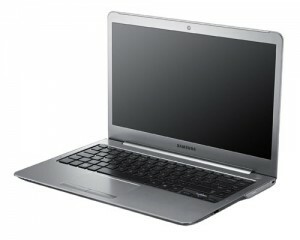 Samsung has officially announced its very first device in the Ultrabook category! That’s right, while there are already a bunch of other companies out there that have launched devices set to knock Apple’s MacBook Air off its pedestal, Samsung has been behind. But no more, as the company is ready to throw its hat into the ring. The 13.3″ Series 5 ultrabook measures in at only 14.9mm thin and weighs a mere 3.08 lbs. In addition to that, it is powered by Intel’s Core i5 ULV processor and comes with a 12GB solid state drive or 500GB/16GB HDD/SSD hybrid, depending on what you want. The Series 5 also has up to 8GB of RAM and Intel HD integrated graphics. This device also features ExpressCache technology, which enables the ultrabook to boot from hibernation in 7 seconds and to wake from sleep mode in only 2 seconds. This device, unfortunately, will only be available in South Korea by the end of this month with a price ranging from $1,125 to $1,298, depending on your specifications. What’s even sadder is the fact that no other information on pricing and availability in other countries has been released. However, Samsung has released a similar 14″ laptop that is reported to be an Ultrabook, though it doesn’t match standard ultrabook specifications. Ultrabooks have a screen diagonal of up to 13.3″, smaller than the one reported. Also, this device measures 20.9mm thick, slightly larger than the maximum thickness of 20mm. It also weighs more than the required 3.08 lbs weight, weighing in at 3.96 lbs. This device does come with the AMD Radeon HD7550M dedicated graphics, whereas ultrabooks, by definition, use integrated GPUs only. The 14″ Series 4 “Ultrabook” will be priced from $1,167 to $1,341 when it is released. on this sort of space . Exploring in Yahoo I finally stumbled upon this website. I needed. I such a lot unquestionably will make certain to don?t omit this web site and give it a glance regularly.